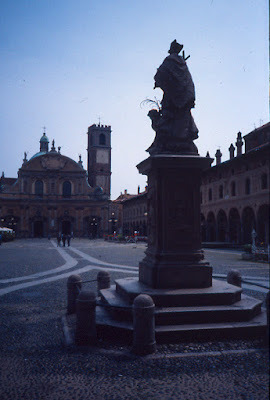 The town of Vigevano, situated south-west of Milan across the River Ticino, is commanded by the fortress developed by successive Milanese rulers. 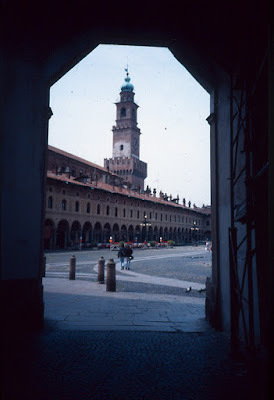 It was the birthplace in 1451 of Ludovico Maria Sforza, also known as il Moro, the Regent and Duke of Milan who developed the new piazza in a single campaign between 1492 and 1494. 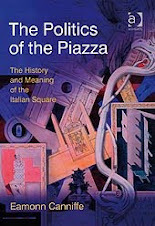 As it survives today, Piazza Ducale is very different from Bramante’s original scheme, although it is still largely defined by the arcades he introduced. They form now a continuous range around north, west and south sides of the piazza, which measures roughly 50 by 130 metres, with the concave baroque facade of the duomo forming the fourth side. 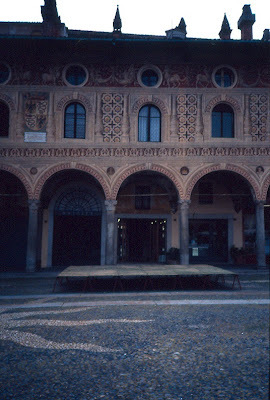 In their original condition, however, the arcades would have been broken in the south-western corner to provide an access ramp to the ducal rocca. The upper surfaces are decorated with painted antique architecture, including triumphal arches which indicate the connections to adjacent streets.